King Street Hub, viewed from Columbia Center | Flickr - Photo Sharing! Three train stations on the same 2-block stretch of South Jackson Street in Seattle, Washington. 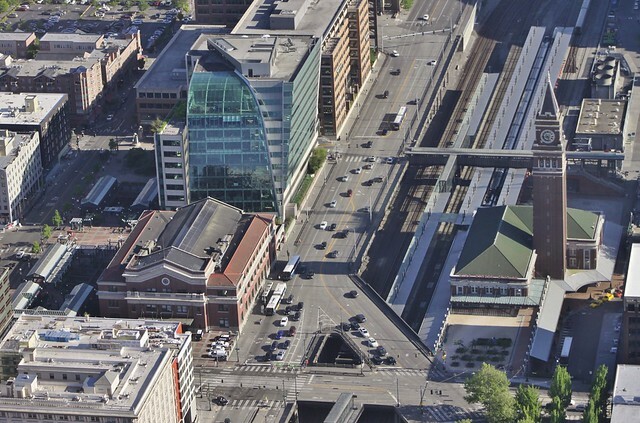 (From left to right): International District/Chinatown Station (light rail and buses); Union Station (former UPRR/Milwaukee Road, now Sound Transit headquarters); and King Street Station (Amtrak, Sounder commuter rail). Not pictured: Two nearby streetcar stations.